Discover a better way to scrub. 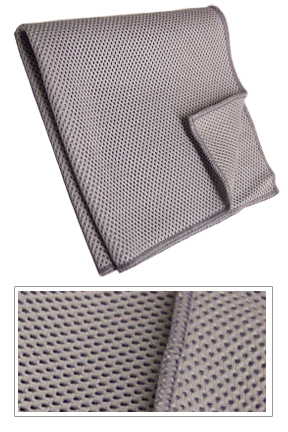 This unique mesh cloth is made of an advanced microfiber material, that is woven into a layered mesh. The advanced design allows it to safely remove the most stubborn dirt and grime with ease. This amazing cloth is able to scrub and scour without being abrasive to any surface you use it on. It is great for washing dishes and countertops, for use in the bathroom as an exfoliating washcloth, for removing bugs from your car and so much more. Great results will be had on any job that normally requires scrubbing or the use of abrasive scrub sponges. You will find endless uses for this remarkable cleaning cloth. The open weave allows it to scrub better, and remove caked on dirt and build-up that is usually reserved for an something much more abrasive. With this cloth, you get increased scrubbing power without the abrasion. Our Super Scrubbing Cloth will never scratch, or otherwise harm any surface you use it on, yet it will easily remove stubborn dirt in a single pass. Finally there is safe alternative to abrasive, green scrubber pads, and one that does not require the use of a dangerous cleaner. The mesh weave allows this towel to safely grab and remove contaminants without damaging surfaces. It is totally reusable and washable for over 500 uses. Stop using old cotton rags. Throw out those bacteria ridden sponges, and switch to microfiber. This 16" x 16" cloth holds more than enough soap, and even die hard sponge-users love washing with it. The microfiber does the scrubbing for you, so you don't have to work as hard when washing surfaces. It is the design of the fabric that gives it such incredible scrubbing power. This cloth is in no way abrasive, and it leaves the surface clean, streak-free and polished with little effort. Use it with great results on pots and pans, vehicle exteriors, the siding on your house, grease build-up on cabinets and any number of other tough cleaning jobs. This scrubbing cloth makes it easy to clean and remove the most stubborn dirt in your home. This cloth is truly a leap in innovation. You will constantly find new uses for this incredible product. It is designed to increase upon the scrubbing ability of normal microfiber cloths, and it can dislodge the most stubborn dirt thanks to it's unmatched scrubbing ability. Despite the power that this cloth delivers, it is safe to use on virtually any surface. This means you will have tons of extra scrubbing power without having to worry about scratching, scraping or marring the surface you are cleaning. Use it in the kitchen for washing dishes and counter tops, or as a bath wash cloth, since it deep cleans the skin while gently exfoliating! It is also great for car detailing and many other cleaning jobs all over your home or office. Microfiber cloths are not treated with any chemicals. It is the unique weave of the fabric, and the size of the individual fibers that make these cloths clean so well. Each fiber is 1/100th the size of a human hair, and they are woven into groups that consist of tens of thousands of threads per square inch. This not only makes microfiber incredibly good at cleaning, but it also makes it highly absorbent. The fiber's wedge shaped filaments follow surfaces, lift up dirt, trap particles inside the fiber, and eliminate the need for harmful cleansers. Recieve discounted pricing when you buy more than one in a single order. Get Yours Today! Super Scrubbing Cloth - These microfiber cleaning cloths have unmatched scrubbing power. This is the best cleaning cloth you will ever use for scrubbing. It is also great for washing cars, wiping countertops, facial exfoliation and more. Order Yours Today! My boyfriends mom gave me one to try and I absolutely love it. I love the way it cleans and I love the way it feels. What is Microfiber?- Learn what it is made of and why it cleans so well. Cloth FAQ- Frequently asked questions. About These Cloths - Learn more about this type of cleaning cloth. Ultimate Kitchen Cloths - A smaller sized cloth made from similar material.